Ran into this recently and wanted to share it with my loyal reader… An Informatica Cloud Application Integration solution that worked wonderfully through months of UAT and flawlessly the first few weeks in production suddenly produced complaints from stake holders because the files output as the end result of the process were empty. Looking at the process logs, there were no errors shown. Every technologist’s favorite finding (sarcasm, for those not blooded in debugging production issues). The application functionality is relatively simple: Listen for new files in a remote folder via SFTP, download the files and rename them for processing by a Data Integration Mapping Configuration Task then run the MCT. I’ll spare you the details of trying to get the details of the missing files except that once they were obtained the pattern I noticed was that the missing files were the largest in the brief history of the application. Not much more deduction required to figure out that in the source environment the files were being written directly to the outgoing folder rather than being created elsewhere and dropped in when complete. The larger files took longer to write than the polling interval so they were being brought down in name only (pun intended). 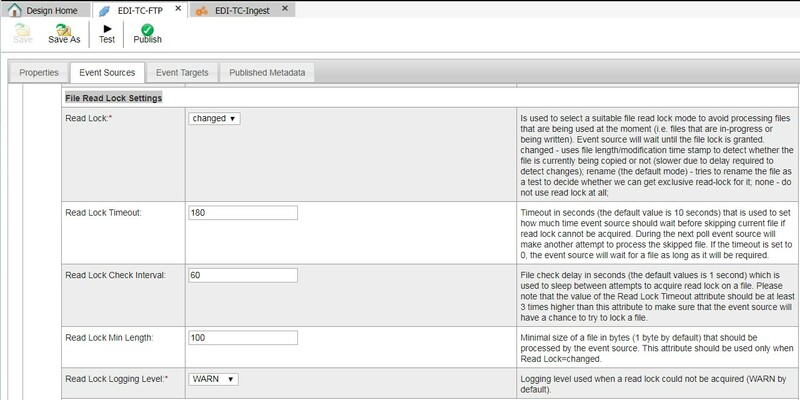 It took a while of reading and re-reading the documentation for the FTP connector to determine that the best strategy for this issue was to use the File Read Lock Settings for the event source, setting the Read Lock value to “changed” and running tests to the get the correct values for the other File Read Lock Settings.